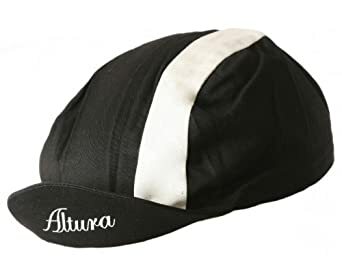 I've killed a couple of traditional cycling caps now, both by breaking the rigid plastic bit that supports the peak while carelessly stuffing it in a jersey pocket or rack bag. So I've got a new one from Walz, which arrived this morning. They do official Yehuda Moon caps. aha, I was thinking you were referring to the kind of plastic fastening and adjusting device often seen on baseball caps. I've just had a look at my cycling caps (I have 5, of 4 different makes ) and AFAICT only one, made by Knogg, seems to have a rigid plastic insert in the peak. The others (including one branded Campagnolo) seem to have rather flexible peaks, which actually work better IMO because they are easier to flip up or down according to rain, sun in eyes, etc. But I'm not going to take them apart to find out what's inside them. It may be the only cycling cap I have ever owned or worn, but I have a Walz. 3-panel yellow moisture-wicking with black 'racing stripe' and my initials because I'm that cool. It is very nice and it looks spiffing; so my wife doesn't think.